Released in 1991, this is a very realistic war game going through the most famous battles of Napoleon's career -- the game comes with Borodino, Waterloo, Quatre Bras, and Auerstadt, but you can design your own ones too. You have the ability to play as either the French or the Allies, and all aspects of the battles are here -- cavalry charges, artillery barrages, infantry squares, and so on. 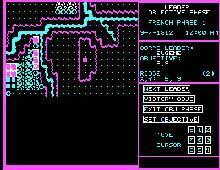 The EGA Graphics are pretty good, despite the age of the game. Downsides include the STEEP learning curve -- the manual is over 100 pages in length -- no mouse support, and horrible sounding PC speaker sounds. If you are looking for a good wargame covering the battles of Napoleon, and have the patience to learn it, this is the best game out there.